Filled with fiber, plant-based protein, and healthy fats, these are the perfect choice when you need a little pick-me-up snack! They are great to make as a “911 snack” as it only takes 5 minutes to make and uses only 6 ingredients! I have to be honest - life can be hard and stressful for me at times. I juggle school, work, this food blog, and my personal life all while searching for grad schools. In everything I do, I strive to be intentional in every moment and hour in my life.For example, if I take a class and pass by the skin of my teeth then what have I gained from the experience? With every new practice, patience and persistence are tested as we don’t always get it right the first time. In the midst of the busy times, I have to continuously remind myself that this is only temporary and that I should be proud of myself for getting this far. As easy as it sounds to be intentional, you need the energy and willpower to actually do it! That’s why I lean on to these amazing lemon and coconut energy balls. Lemon and coconut is an excellent pairing as they are both sweet and refreshing. This flavor-packed combination is great with the caramel undertones of pitted dates; the creamy texture provided by cashews and almonds is also a big plus! Cashews, almonds, and dates are magnesium-rich foods that actually boost energy and prevent inflammation. Magnesium is key in creating energy by activating ATP; (adenosine triphosphate) which is an energy carrying molecule found in the cells of your body. Ultimately, when you have an adequate amount of magnesium in your system, your body is primed to function at its peak. 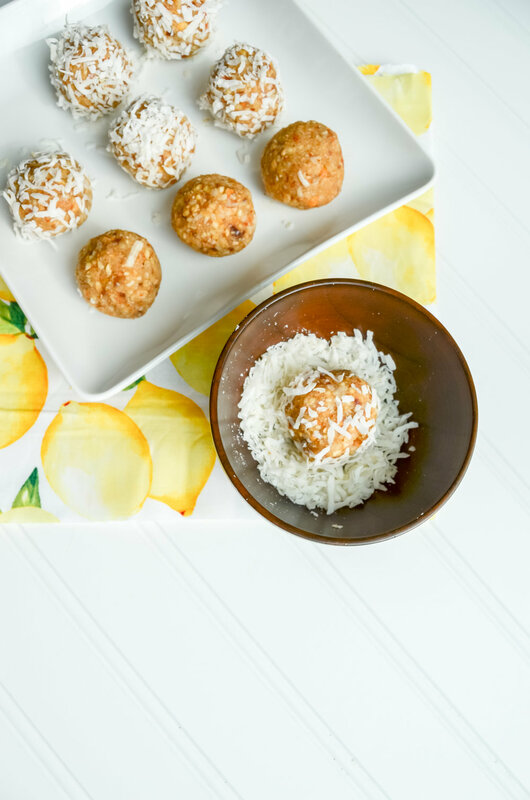 Not only are these lemon and coconut energy balls great for providing energy and preventing inflammation, they’re nutrient and calorically dense. Filled with fiber, plant-based protein, and healthy fats, these are the perfect choice when you need a little pick-me-up snack! They are great to make as a “911 snack” as it only takes 5 minutes to make and uses only 6 ingredients! I recommend making a couple of batches so that you can store half in the fridge for immediate use throughout the week and the other half in the freezer for a later time. If you try this recipe, let us know! Leave a comment, rate it, and don’t forget to tag a photo with #fromtherootsblog on Instagram. We love seeing what you come up with! After dates have properly soaked, remove dates and set date water aside. Blend all ingredients in a high-speed processor until desired texture. If the consistency seems dry, add a little bit of the reserved date water. Scoop out about 1 tablespoon of the mixture, and form into balls. Roll into your favorite toppings! I like to use lemon zest and coconut flakes. These can be stored in an airtight container in the fridge for up to two weeks or in the freezer for up to a month. Make large batches to store snacks ahead of time. Be the first to receive all things health and wellness, new recipes, gift guides, and more!